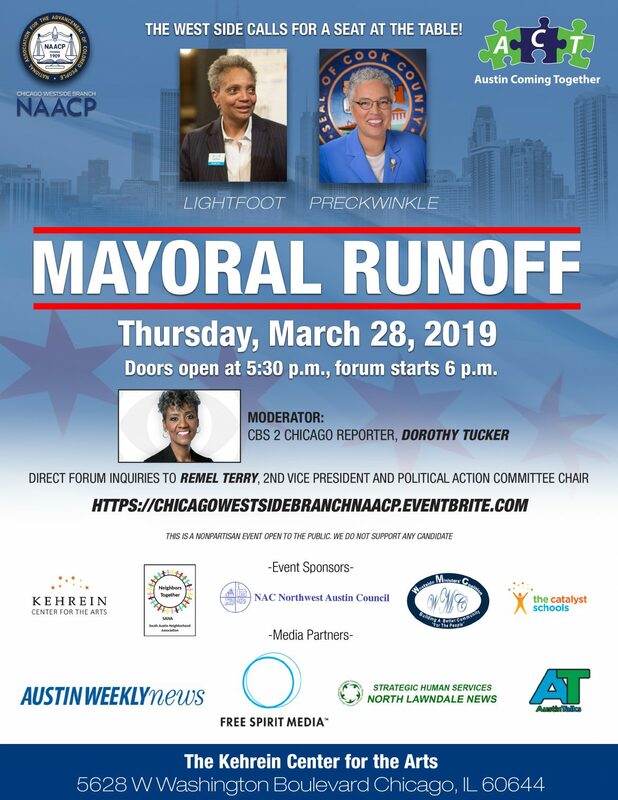 On Thursday, March 28, the Chicago Westside branch of the NAACP and the Austin Quality of Life Plan’s Taskforce for Civic Engagement will host a candidates forum featuring mayoral candidates Lori Lightfoot and Toni Preckwinkle. CBS2 News reporter Dorothy Tucker will be the moderator for the event, which will be held at the new 1,000-seat theater at The Kehrein Center for the Arts, 5628 W. Washington Blvd. Doors will open at 5:30 p.m. Thursday, and the forum will begin promptly at 6 p.m. The event will be the first held at the theater after undergoing a $4.5 million restoration supported by the city’s Neighborhood Opportunity Fund. “The people of Austin are coming together like never before to take ownership in transforming their community and the West Side,” said Darnell Shields, executive director of Austin Coming Together. “Chicago hasn’t seen this type of civic engagement since the historic election of Mayor Harold Washington, and West Side stakeholders are demanding a seat at the table,” said Karl A. Brinson, president of the Chicago Westside branch of the NAACP. The candidates forum is a public, non-partisan event sponsored by the Chicago Westside branch of the NAACP, South Austin Neighborhood Association, Northwest Austin Council, Westside Ministers Coalition and Austin Coming Together. The Austin Weekly News and AustinTalks also are sponsors. The runoff is April 2.